Another early start – what is going on ? well motels on highways, road trains that never sleep and fellow travellers that work in mines make for an uneasy sleep and early morning! 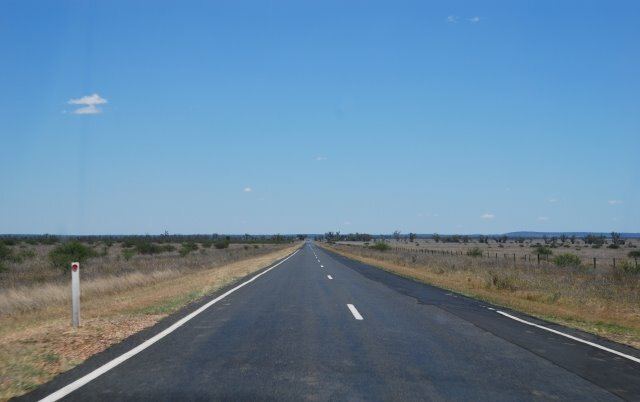 Today we headed from Roma to Longreach via Morven, Augathella, Blackall – which claims to be the site of the mythical black stump and is also famous as the site of the first artesian well to be drilled in Queensland and where we could have picked up a beautiful little fluffy border collie, for only $200, b argain, pity we had no room in the back seat – and then Barcaldine, the town that gained a place in Australian history in 1891 when it became the headquarters of a major shearers’ strike. The confrontation led to the formation of the Australian Workers’ Party, now the Australian Labor Party! We are slowly but quickly being acclimatised to the weather up here with the temperature reaching 25 by the time we hit the road at 8am. 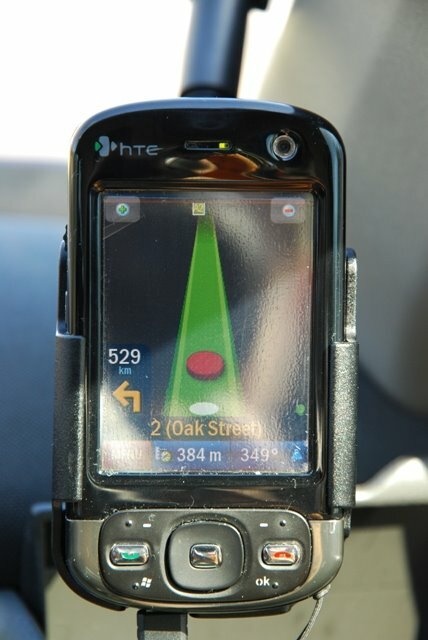 It’s possible that we should have sensed the day was not going to be exciting (well yes we realised it wasn’t going to be the French Alps) when Jessica (the GPS lady) advised 530km then turn left … hmmmm. The scenery was a little different today we left the wheat belt behind and entered droving country – endless plains with clumps of trees followed by endless plains. We came across a couple of very large caravans’ droving their stock along the stock route – a very impressive sight indeed. We saw some emu’s and we are afraid to say hundreds of dead kangaroos – road kill – far more then we were even expecting to see, it’s very sad. 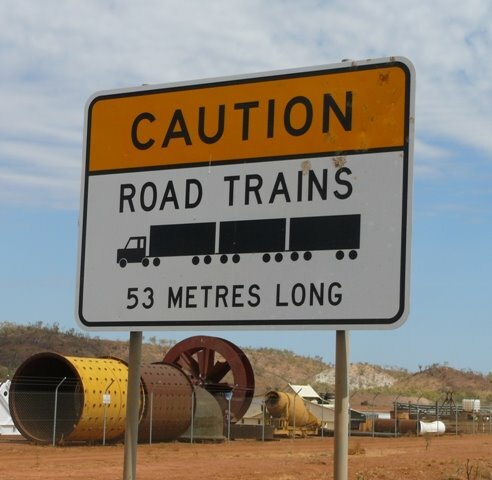 So other than our coat of arms, cattle, birds, road trains and very few vehicles our day was very uneventful. Longreach is a prosperous outback town that was home to Qantas early last century and is now also famous for the Stockman’s Hall of Fame. The human population is vastly outnumbered by more than million sheep and quite a few head of cattle. 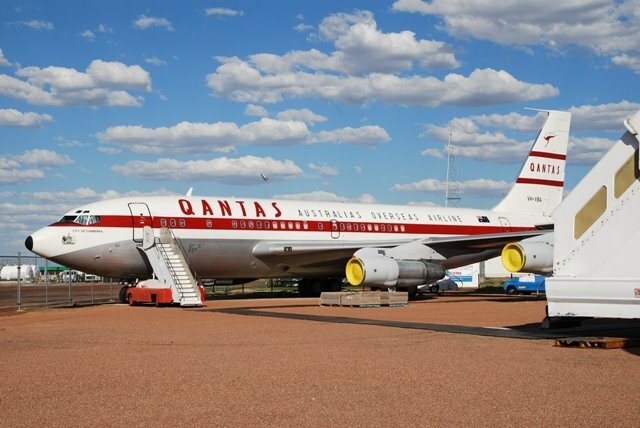 We arrived in Longreach mid afternoon and decided to do some sightseeing – the QANTAS museum um let’s just say unfortunately very overrated for the very steep entry price – a decent collection but not for the money. The Boeing 747 and 707 were not open (and were a separate entry fee) so we really bummed out on that one. We are going to head over to the Hall of Fame tomorrow morning before we head off for Mt Isa. 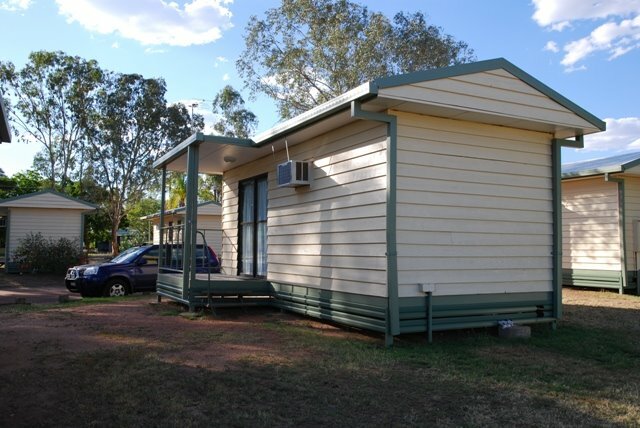 Our home for the night is a tiny, well not shoe box but still smallish little hut in a caravan park that was like a sweatbox – thank g_d for AC !!!! we had an ok dinner at the rissole and then b ack to the hut (which thanks to leaving the AC on was actually quite pleasant) to crash. It seems we are not doing as well with food on this trip as we did overseas – yesterday we had pretty simple but easy beef and pickle sandwich which was more like pickles with some beef and wrapped in a little bread, for lunch today we had chicken and gravy roll at the truck stop, which was more like gray with chicken and wrapped in a little bread, tonight for dinner we had lemon chicken (think coated frozen Steggles kind) which probably wasn’t too bad and some ribs, which when they took 15mins to bring them out we were not that hopeful – not bad but in the middle of beef country you’d think you could get some decent ribs !! Petrol has been surprisingly cheap approx. $1.30/L … so long as you drive past the first station (now so named tourist trap) as they are pretty much always 20 cents more – ha we are smarter than the average Joe … we drive through town first then go back to the cheapest !!! 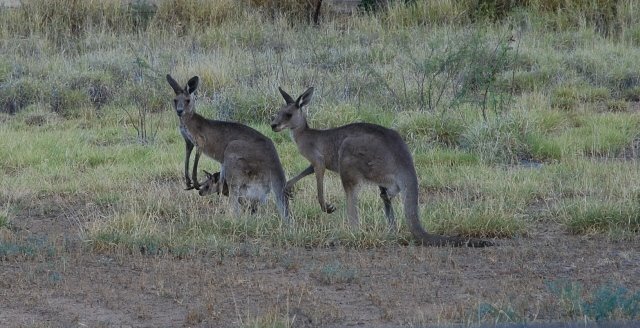 Whilst our home may be a bit of a hut it did have kangaroo’s – alive – hanging around when we arrived, one even had a little joey in its pouch – aw sooo cute !!! They have funny little front paws they are very like hands – it’s very cute.